The oldest male Rowden to have lived died at the age of 102. Thomas Rowden was born in Exeter, Devon on 26th May 1842 the son of a carpenter. His parents, John and Ellen (née Hooper) had been married more than a decade earlier at St Sidwells, Exeter and it seems that Thomas was their one and only child. John Rowden was from Crediton, about 5 miles north-west of Exeter and his family had relatives living in nearby Sandford. As he grew up in Exeter, Thomas trained, no doubt under the watchful eye of his father, as a carpenter and joiner. In 1859, perhaps needing some excitement, he enlisted in the Royal Marines and moved to Plymouth. The 1861 census shows Thomas serving on H.M.S. Conqueror at Devonport. In Plymouth at the age of 24 years Thomas married Ellen Jones and their first child, Helen, was born a year later. Eight further children followed over the next 17 years although at least 3 died as infants. Albert, a popular name of the time, was given to their last boy who was born in 1883 a few years after Thomas was demobbed from the Marines. Ellen died in 1884 but in 1886 Thomas married again. Caroline Crabb, his second wife, bore him 3 further children. 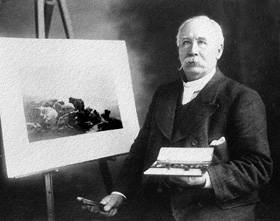 After leaving the Marines in the July of 1880, Thomas moved back to Exeter and set up as a self taught artist. Moorland scenes are the main subject of his work, invariably including wild ponies or cattle in their natural setting. Dartmoor and The Highlands are the prominent locations but occasionally other areas feature such as Romney Marsh in Kent. Mr Rowden was highly successful in bringing about the romantic beauty of Dartmoor, its boundless space and bold scenery as a setting to the cattle, sheep or ponies quietly reposing or grazing by the heathery slopes." Find Tom and his family in sept 6 pedigree chart.